I have had these knocking about in the fridge for a couple of months so I decided to make the best of the warm weather and see how refreshing they are. 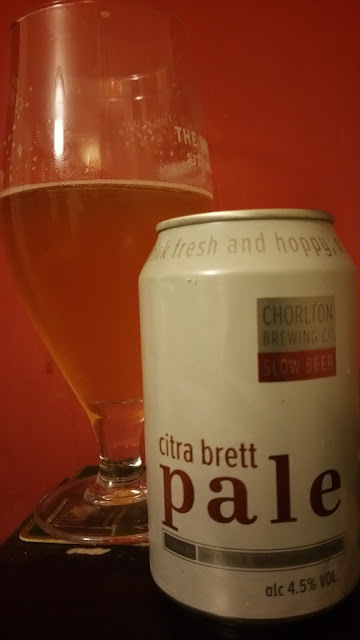 From Chorlton Brewing in Manchester is a Citra Brett pale ale. It's only 4.5% so I figured it would be a good one to start off with. I actually had two of these and the other one I had a few months ago but I didn't write about it. The reason was because the can had expanded and looked deformed. The interesting this is that I noticed a few cans like that when I picked it up at the off-licence so the beer is clearly a little over-active in the can. The beer is fermented entirely using Brettanomyces which while not unique, is certainly not the norm. It's also first and foremost a pale ale and uses citra and waimea hops, always a good combination. All of this leads to a bitter and tart beer that has a sort of rosemary, herbal thing going on. It was very dry and bordered on astringent. A fair bit of lemon sherbet kept it from being overpowering. All in, it was a really satisfying beer on a warm and sunny evening. Sur Amarillo from To Øl is similar in that it's another sour pale ale but this one is a 7.5% beast in a much larger can. This was much more extreme in the tart and bitterness end of the spectrum. 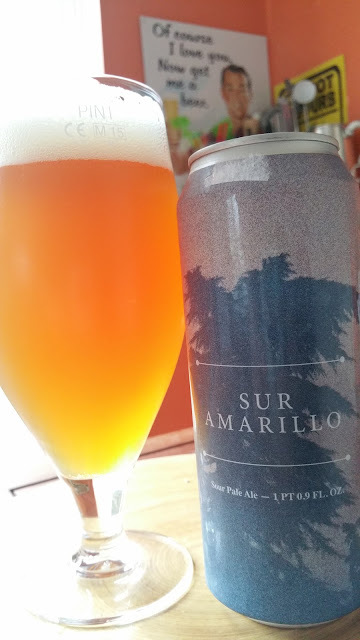 This is a purely amarillo hopped beer hence the name. Lemon and a slight straw grassy and tropical note with some orange pith help to keep the bitter and tart extremes in check. Another refreshing sour beer to end the evening on. We don't have access to your fridge so it'd be cool if you mentioned where you picked them up and for how much, so that we could try em too! I don't actually recall the answer to either of those questions so I didn't mention it. If it helps, I picked them up in Belfast a short walk down from Brewbot. Vineyard probably.